Isn't this stunning. 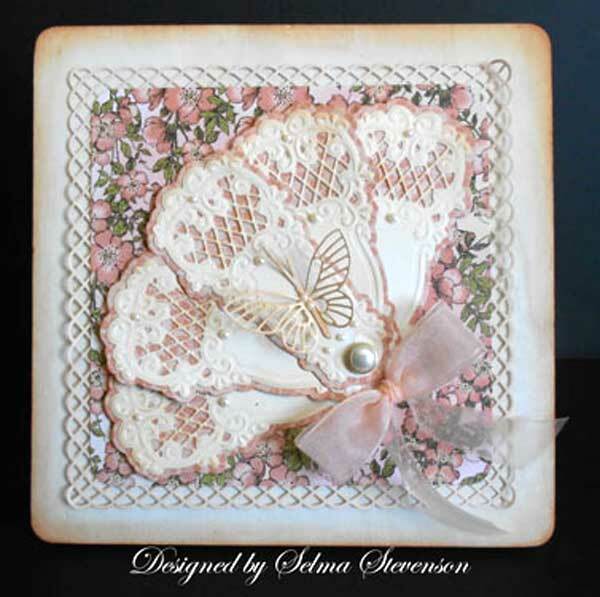 Selma created it using the Marianne Fan dies (LR0265) and then once she completed it she attached it to a wooden frame. What a gorgeous presentation and would make a fantastic gift for someone special. You can read all about it by clicking here! Use some type of Fan - stamped, die cut, etc. You will have until next Thursday (May 9) morning 6:00 AM EST to link your project. A winner will be chosen from a random drawing for week #17 The winner of the challenge will be announced Friday, May 10. This week's winner will receive a Tim Holtz Ink Pad set. The winner will also be entered in the 2013 end of the year $100 gift certificate drawing. OMGosh....yes yes yes...stunning. I have that paper, now to only have that die. I have a LOT, but not that one...hummm Again, amazing!